On the occasion of the third centenary of the appointment of Johann Bernoulli at the University of Groningen, a number of linear systems solvers for some Laplace-like equations have been compared during a one-day workshop. CPU times of several advanced solvers measured on the same computer (an HP-755 workstation) are presented, which makes it possible to draw clear conclusions about the performance of these solvers. Botta, E.F.F, Dekker, K, Notay, Y, van der Ploeg, A, Vuik, C, Wubs, F.W, & de Zeeuw, P.M. (1997). 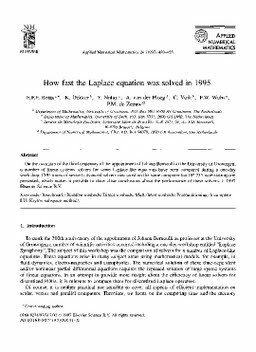 How fast the Laplace equation was solved in 1995. Applied Numerical Mathematics, 24(4), 439–455.